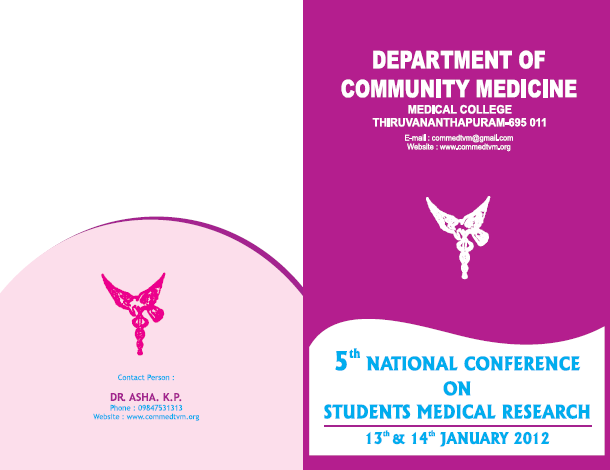 The Community Medicine department of Medical College, Thiruvananthapuram is organizing the 5th National Conference on Students’ Medical Research. 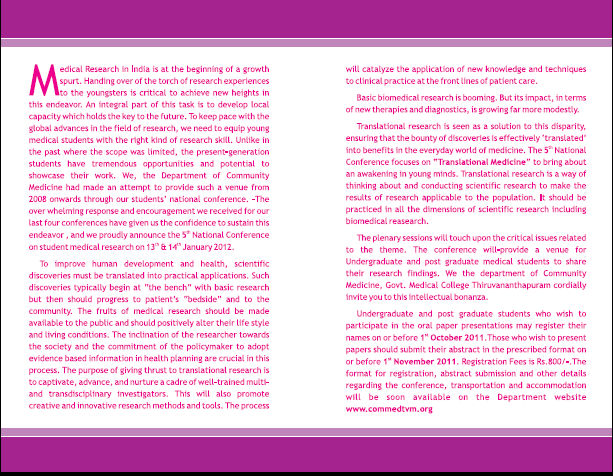 The theme for this year is: Translational Medicine. Their website has more details. To improve human health, scientific discoveries must be translated into practical applications. Such discoveries typically begin at “the bench” with basic research in which scientists study disease at a molecular or cellular level then progress to the clinical level, or the patient’s “bedside”. Growing barriers between clinical and basic research, along with the ever the increasing complexities involved in conducting clinical research, are making it more difficult to translate new knowledge to the clinic – and back again to the bench. These challenges are limiting professional interest in the field and hampering the clinical research enterprise at a time when it should be expanding. With its focus on removing barriers to multi-disciplinary collaboration, translational research has the potential to drive the advancement of applied science.The purpose of translational research is to captivate, advance, and nurture a cadre of well-trained multi- and inter-disciplinary investigators , to create innovative research tools and information technologies and to synergize multi-disciplinary and inter-disciplinary clinical and translational research and researchers to catalyze the application of new knowledge and techniques to clinical practice at the front lines of patient care. However, one thing that I was wondering about is whether the participants have to submit research oriented to topics only about Translational Medicine. If that is the case, then it would “scare off” a lot of potential participants because as far as my knowledge about medical student research in the average Indian medical school goes, proper translational research is literally non-existent. So, keeping that in mind, I really hope the conference accepts all kinds of papers. Though I have heard of this program since my medical school days, I never quite managed to participate in it since the dates of the program usually coincided with my professional MBBS exams. Now there are a lot of things I am willing to forego for the sake of presenting my research, but the MBBS professionals are not one of them! The registration fees are nominal and since this is the 5th edition of the conference, this may well be the oldest medical student conference in the nation! That and the compelling theme for the whole issue makes it a must visit! If you are an Indian undergraduate or a postgraduate student with some research work up your sleeve, this seems like a great place to present it! I must also say that since the KVPY season just got over, a lot of you may have some projects in your hands that you may have done or have left in limbo because you ran out of time for applying to KVPY, and you may complete the projects now and see if you can present your findings at this conference. This might be a great way to get your work out there! 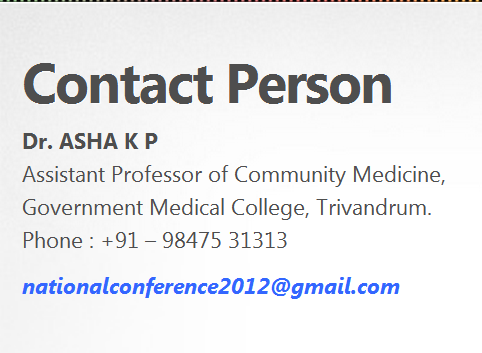 Tags: Conferences, KVPY, Medical Education, Medical Research, Medical School, Medical Student, PostADay2011, Presentations. Bookmark the permalink.